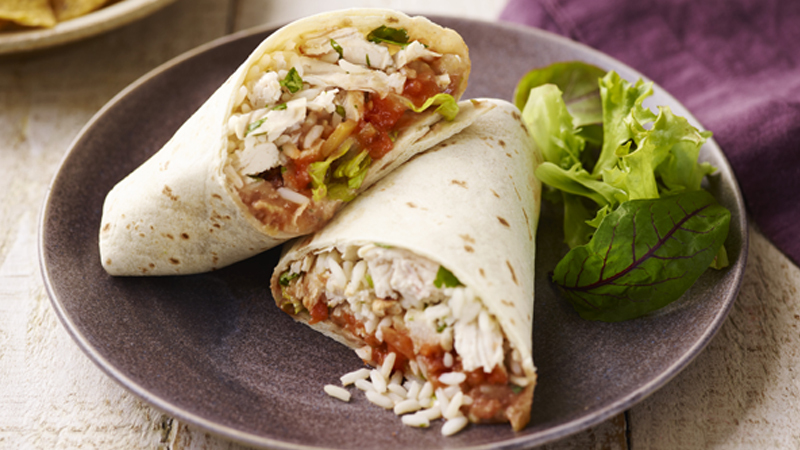 Packed with rice, chicken, refried beans and salsa these tasty burritos are great for taking on picnics or for packed lunches. 1. Heat the rice in the microwave following the directions on the packaging. Transfer to a large bowl and leave to cool completely. Add the lime juice, coriander and chicken to the bowl. 2. Wrap tortillas between two paper towels. Microwave on High 30 seconds. Place 1 tortilla on work surface. Place about 1/2 cup chicken mixture on middle of tortilla. Top with 2 tablespoons each beans, salsa and lettuce. Add soured cream on top. 3. 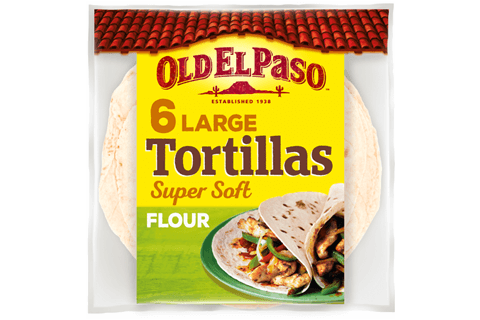 Fold edge of tortilla closest to you toward middle of mixture; repeat with edge farthest away. Starting with right side, begin to fold tortilla up slowly, ensuring that folded sides remain intact. Continue until burrito is completely enclosed. Cut in half before serving, wrapping in foil if desired. Serve remaining beans on the side, if desired. For a more peppery flavour replace the shredded romaine lettuce with rocket leaves or watercress. Try adding some drained tinned sweetcorn or diced red pepper to the chicken mix.